[2015 Sept] Flu Shot Causes Polio-like Guillain-Barré Syndrome: Are Rates Higher Than the Government Admits? Vaccine Court Judgements for Flu Shot Injuries by Dr. Sherri Tenpenny DO This is a partial list of cases that were awarded damages by the US Government via the “Vaccine Court”, which is a federal court of claims for the FLU VACCINE. Note the number of deaths, in just 2012. [2011 June] Dr. Lawrence B Palevsky’s Comments on Guillain-Barré Syndrome Rates After Vaccination epidemiologists twist the statistics to understate the occurrence of Guillain-Barré syndrome (GBS) after vaccination. [2011 June] FDR Didn’t Have Polio, He Had Guillain-Barré syndrome? wouldn’t it be ironic if the entire polio vaccine development program was instigated by the victim not of polio, but of a vaccine adverse reaction? That would make the polio vaccine the first anti-vaccine vaccine. [2010 Feb] Flu shot blamed for paralysis Stephanie Willette went from being a healthy nursing student to suddenly being a helpless patient paralyzed from the neck down with a tracheotomy so she could breathe. Today the 20-year-old is slowly recovering in a Kingston rehab hospital, still unable to sit up, but hoping that she’ll eventually walk again. [2010 Jan] One small needle, a world of trouble Donna Hartlen, a young mother who is now partially paralyzed, has been diagnosed with Guillain-Barre syndrome. [2010 Jan] Fewer swine flu jabs as doc falls ill A 58-year-old cardiologist who received a human swine flu (H1N1) vaccination is in serious condition with Guillain- Barre syndrome, a disease that affects the nervous system. [2009 Aug] LITTLE KNOWN FACTS ABOUT POLIOMYELITIS VACCINATIONS by Viera Scheibner These days, when a vaccinee develops poliomyelitis, it may not be called poliomyelitis; instead, it may be called viral or aseptic meningitis, ascending paralysis (Guillain-Barre syndrome), cerebral palsy (over 75 per cent of cases are not diagnosed at birth but after six months) or other such names. [2009 Nov] Va. teen suffers rare illness after swine flu shot Jordan McFarland, 14, was hospitalized for five days after coming down with Guillain-Barre syndrome hours after receiving a vaccination for H1N1. [2009 Oct] Autism One: A Conversation of Hope with Teri Arranga: GBS Post Vaccination She received a flu and a tetanus vaccine in July. In addition to still developing a flu-like illness, little did Melissa know that she would soon land in an internationally renowned neurological center for brain and spine diseases, expected to die. Melissa now believes that her severe symptoms and the treatment she received following the two vaccines in July fit a case of Guillain-Barre Syndrome. “Examining the FDA’s HPV Vaccine Records: Detailing the Approval Process, Side-Effects, Safety Concerns & Marketing Practices of a Large Scale Health Experiment,” In total, 8,864 reports have been filed. The VAERS reports document that there have been 38 reports of Guillain-Barre Syndrome among girls who received the Gardasil vaccine. The VAERS reports also reveal as many as 18 young girls and women have died after receiving the vaccine. Of the eighteen deaths, eleven of them occurred less than a week after receiving the vaccine, and seven in less than two days. The most common diagnosed cause was blood clotting. A mass polio vaccination in Finland (1985) resulted in a higher incidence of Guillain-Barre (GBS) cases in the first two quarters (16 total) compared to a mean incidence of GBS in the population of 3 cases per quarter during a 6 year surveillance period, 1981-1986. Ten of these were diagnosed within 10 weeks after vaccination with OPV. The Vaccine Safety Committee has acknowledged that OPV causes both paralytic polio and Guillain-Barre syndrome. 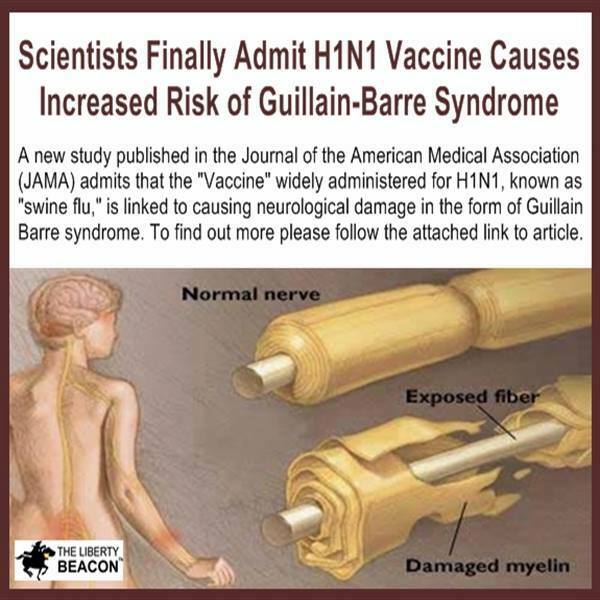 Health officials had convinced the Chinese to rename the bulk of their polio to Guillaine-Barre Syndrome. This went along without a hitch for some time, until a research team suggested giving it a separate name - Chinese Paralytic Syndrome. This prompted an even closer look at the data. A later study (in Hebei province) found that both the new disorder and the Guillaine-Barre Syndrome was really polio. They came to their conclusion by looking at the trends in polio from 1955-90 and noted that, after mass vaccination started in 1971, reports of polio went down but Guillaine-Barre syndrome increased about 10-fold. Once again, polio was still there but wearing a different name tag. (Vaccination by Greg Beattie p68). A REPORT ON MMR QUESTIONNAIRES AND PERSONAL COMMUNICATIONS. Young sailor develops Guillain-Barre Syndrome after Anthrax vaccination.